Encased ball bearing is embeded inside the earbud. Placement of the ball bearing provides rust resistance and ensures the comfort of the earplug. 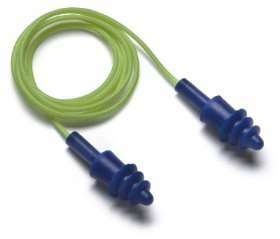 Three flanges of soft rubber polymers form a cozy seal for all size ear canals. The pre-molded earplug is constructed of flexible ruber wrapped around a pocket of air for superb comfort. Packaged in a convenient dispenser box of 100 pair.